It has not been worry free days for me since I heard that there will be a Super Typhoon to hit my country, The Philippines. It was reported as the strongest typhoon ever recorded in the history having over 198 km/h. Communicating to my loved ones on the situation I am relieved knowing they are safe. Everyday since the reported typhoon to hit the country, I keep my eye on the latest Philippine news channel updates. Not just the strongest but also the biggest typhoon to have covered almost the entire country, the video feeds of local news channels scared me for people who lives in the most affected areas. Tacloban City was the mostly reported place during the typhoon, it was in Central Philippines and since most reporters were positioned in that province, the feeds were mostly from that city and the nearby areas such as Palo, Leyte. Here’s a YouTube video of the event while it was happening, although it is in Tagalog language, he was reporting that even people in the evacuation area died when the water from the coasts rose up until 10m high, they called it ‘Storm Surge’ that drowned people in the evacuation center. This is just one area of the country. Imagine how many people died and damages all over the nation. Now, the typhoon is gone along with all the debris, electric post lines, trees, vehicles, and corpses scattered everywhere, rescuers and relief distributors are having hard time to get the goods to the victims because of the road accessibility. Let’s not forget that electricity, internet, phone lines are out as it was all damaged by this tragic calamity. As of now, they are expecting to have almost 10,000 casualties all over the country. I could not fathom how they are taking all this in, ruined city, no house, no food, missing family members, dead family members, and injuries all at once. I would like to at least help by donating and sharing ways to help to other people’s kind hearts to help Philippines who are just recovering from an earthquake last month. WE ACCEPT DONATIONS AND NEEDS MORE VOLUNTEER, PLEASE! Please refer to the above photo for your donations and contacts for volunteers. 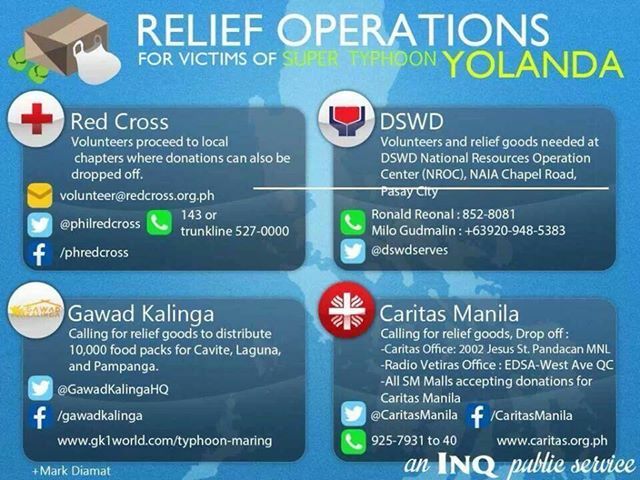 Also, Red Cross accepts donations through PAYPAL (in Philippine Peso currency default) at: http://www.redcross.org.ph/donate. May everyone of us find a soft spot for our Filipino brothers and sisters who needs our help desperately, donations, a hand, and prayers will help them a lot. Let’s try our least to reach out.